The thing about birthdays is that everyone has one, even if they don’t celebrate it. Because I grew up as a Jehovah’s Witness, I never had or attended birthday parties as a child. Don’t frown, I didn’t miss them, I was too busy knocking on stranger’s doors! To this day, I sort of stink at remembering birthdays and other Hallmark suited occasions because it is just not in my DNA. (For proof see related post; The Longest Birthday) But that doesn’t mean I give bad gifts, quite the opposite, I am pretty damn awesome at gifts. I just prefer to follow my own timetable. Fifteen years as a parent has forced me to become slightly more proficient at birthdays because my kids love them. And although 15 year old Sweetie Boy and 13 year old Venom Pen have reached the gift-card-preferred stage, 8 year old Sistafoo remains deep in the heart of birthday party country. When she was in Kindergarten I made the rookie parent mistake of trying to select unique gifts for every child, foolishly involving Sistafoo which only prolonged the process because she has terrible taste and always wants to buy something flammable, breakable or edible (see poisonous). Last year I settled on a happy compromise that makes birthday party gift-giving a snap while still letting Sistafoo prove her bad taste to the world. I choose one quality, general appeal item, buy multiples and then allow Sistafoo to customize it with what we call the “add-on.” Add on gifts can vary in price and genre and is selected with the individual recipient in mind. This year’s buy in bulk Slam Dunk Gift, is a Watercolor Art Set by Xonex that Santa originally found for Sistafoo. I searched high and low for more when we discovered how vibrant the colors are, and how convenient it is to stash the adorable wooden storage box they come packaged in. A quick ten minute after school trip to a nearby store is usually all it takes to get the add-on which gets tied to the top or slipped under the bow of the main package. Cassie’s paint set had a Pillow Pet key chain tied to the ribbon. Rena received a pad of nice watercolor paper tucked under the ribbon of her paint set. Ava’s paint set was wrapped and tied with a scarf disguised as a ribbon. 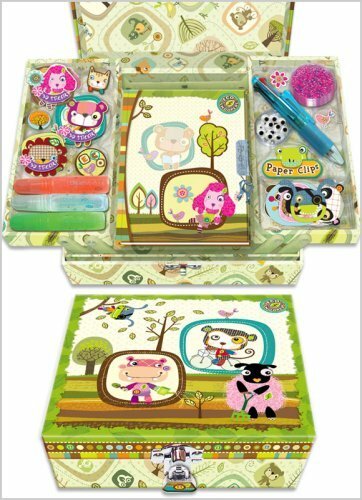 Last year Sistafoo showed up at nearly every party with this cool Eco Snoopers, Make Your Own Diary Kit, a cute, sturdy multi-compartment box holding shiny bits of stickers and glitter, stationery and writing utensils that make little girls drool. Now it comes in pink too, although I think the green is more attractive and unexpected. I loved making the trek to the fabu Explore Store inside KidsQuest Children’s Museum for that gift because not only does shopping there support one of my favorite nonprofit organizations, (I am a former Board Member) but buying a gift off the beaten path means less chance for duplication which always results in a fast pass to awkward conversation hell because kids are not particularly smooth or gracious by the time they have opened the same gift three times. Now it’s the end of June, and my gift closet is down the last Vintage Dot Art Set which presents a conundrum. Sistafoo has two parties next week, do I order another art set, concentrate on finding the next bulk thing, or punt and set Sistafoo free in the land of plastic baubles. Hmmn. What’s your favorite Slam Dunk gift? A phrase I have used for years, and also is a regular feature from my friends at Momfilter. Check it out and let me know if you have any clever finds I should know about before next Friday. 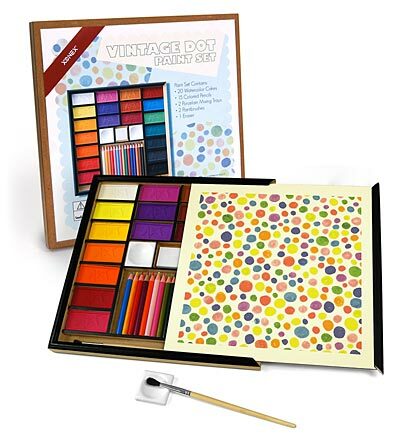 Great tip – will have to look for the watercolor set – as well as more “go to” gifts to stash away. My slam dunk gift from March-July is a fun bathing suit. Let your kid pick which bathing suit (color, style, characters from a favorite movie) but a suit it will be. If we are especially friendly with the family, maybe a colorful matching towel too. No chance of overlap with toys they already own, and high likelihood that it will get used. Plus, I always include a gift receipt in case I got the wrong size. Many parents have thanked me for this gift! Hey Joe, I love my gift closet, major lifesaver? Carol, Fantastic idea, must try!